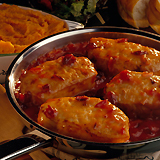 Preheat oven to 350 degrees F. In a large skillet, brown pork chops in a tablespoon of butter. Place chops in a baking dish. Mix together the cranberry sauce, honey, and cloves. Pour over the pork chops. Lay orange slices on top of sauce. Cover and bake for one hour. Note: I used boneless thin cut pork chops and baked for 30 minutes.